This article first appeared in The Edge Financial Daily, on November 23, 2017. Expanding bike lanes, handing out free helmets and making lessons free: New York is making great strides in encouraging pedal power at the expense of exhaust fumes, even if some cyclists are still nervous about navigating bottleneck traffic. For years, the city of 8.5 million —which has the most extensive public transport network in the United States — stood and watched the bike boom take off in European capitals. 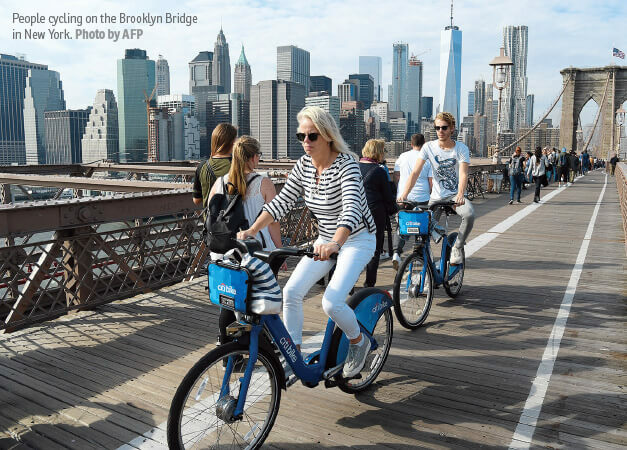 In 2013, then billionaire mayor Michael Bloomberg launched the Citi Bike sharing scheme and since then, New York has seen the fastest growth rate in cycle use of any big US city. “The city has come a long ways in terms of having a much stronger commitment to promoting bicycling,” says Rich Conroy, education director for Bike New York, a non-profit organisation that encourages safe cycling. “People realise we can’t grow as a city by building more streets and adding more cars,” explained Conroy. The city’s transportation department says 778,000 New Yorkers — 12% of the adult population — have biked regularly in 2017, more than triple the 250,000 of five years ago. Citi Bike mirrors that progress: Its annual membership has risen steadily, reaching 245,000 in the year ending September, compared with 200,000 a year earlier. In the last five years, the city’s transportation department has expanded and enhanced the on-street bike network by nearly 300 miles (480km). Around 86,000 New Yorkers — 2.5% of the population — now use a bike to get to work or school. One of them is Soe Thi Ha, 29, who rides 12 miles a day between Manhattan and his Brooklyn apartment. “All my friends were doing it. I saw all the bike lanes. I said if they can do it, I can too,” says the Burmese New Yorker, who works in marketing psychology. Yet however enthusiastic riders may be and however much an increasingly dilapidated and unreliable subway encourages people to pedal, cyclists worry about safety. Cycling in parts of Manhattan is not for the faint-hearted. Eighteen cyclists were killed and nearly 5,000 injured in 2016. Bridges, tunnels and avenues are packed with buses, trucks, sport utility vehicles — and potholes. “I’ve been riding all my life, I have never had a car but I’m very frightened on New York City streets,” says Ilene Richman, 53, who works in health care. When eight cyclists were killed in a Halloween truck attack carried out by an apparent Islamic State sympathiser in TriBeCa, it was a reminder of other fatal accidents on the same Hudson River bike path easily accessible by cars from the road. To conquer her fear, Richman signed up for free lessons from Bike New York, given to 17,000 people last year. Supported by the city, the organisation teaches safety — ring your bell, observe traffic lights or even yell “yo” to signal your presence to drivers and pedestrians. But in a country that runs on the car, Conroy says it’s drivers who need better training. There’s also another drawback: Electric bikes (e-bikes) are illegal in New York. If that’s surprising in a city that considers itself at the forefront of progress, many fear the danger posed by delivery persons — ubiquitous in a city where preparing dinner often means dialing for takeout — on electric bikes. The city has put the brakes on legalising e-bikes, says Morgan Lommele from the association People For Bikes, who is also an e-bike campaign manager. Fining e-riders is also a lucrative source of income for the police department — a US$500 (RM2,060) fine or confiscation of the bike are risks disproportionately borne by delivery men, often recent immigrants on poor salaries. With controversy growing, Lommele hopes Mayor Bill de Blasio will make good on his commitment to the bike and eventually change his mind.